Jennifer duBois is very clear about one thing: this book is not about Amanda Knox, the American college student accused of murdering her roommate while studying abroad. There are disclaimers at the beginning and end of the book adamantly stating such. 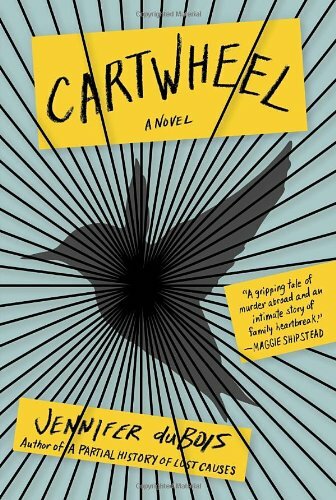 However, Cartwheel is definitely inspired by real events, and the story duBois imagines is even more compelling than the splashy, sensational news articles that proliferated during the Amanda Knox case. Instead of Amanda Knox, duBois’s main character is Lily Hayes, a Middlebury student spending a semester abroad in Buenos Aires. Lily’s roommate is Katy Kellers, an attractive, somewhat reined-in blonde from California. Lily is outspoken, blustery, careless, but masking a deep insecurity—a combination that ultimately leads to her arrest once Katy is found stabbed to death in their shared bedroom. Layers of Lily’s personality are revealed through varying third-person points of view, including her father’s, her sister’s, her Argentinian boyfriend Sebastien’s, the case’s primary investigator Eduardo’s, and her own. Parsing the various views of Lily to determine what she might be capable of is, though I hesitate to potentially cheapen it by using this phrase, a lot of fun, and it’s what gives the book its incredible momentum. Could Lily, a typical, if somewhat spoiled and egocentric young woman, really have participated in such a brutal act? What combination of factors could possibly spur someone like her to such evil? Sometimes books start out with a great premise but suffer in the execution. I don’t want to intimidate you with a macho sports metaphor, but it’s kind of like Olympic figure skaters who attempt the triple-triple combination and end up flubbing the landing. There’s a lot of anticipation and excitement leading up to the jumps, but at the end of the day, everybody wishes they’d just stuck with something in their wheelhouse. This book, however, combines a fascinating hook and an intelligent, skillful execution. Now that I’ve brought up figure skating, the question you’re probably asking yourself is, what would Brian Boitano do? Brian Boitano would read this book.